Dr. Partha Nandi (right) on the set with Michigan native and Biggest Loser Jeremy Britt. When Dr. Partha Nandi struck up a conversation at a private dinner party, he never dreamed it would lead to a second full-time job. The father of one of the guests was battling pancreatic cancer, and Partha, a metro Detroit-based gastroenterologist, took note. For the next hour, the doctor thoroughly went over the disease, discussing treatment options and insurance issues so the man could better understand the situation his father faced. Another dinner companion took note, but for very different reasons. This person was an independent television producer from Los Angeles and a guest at the same party thrown by mutual friends. It was a flattering observation that might have lived and died at the dinner party, as such observations tend to do. But the Nandis took the producer seriously. Right place, right time? It turns out the producer wasn’t just being polite. His production company would go on to invest thousands of dollars in a show concept that, like so many others, has yet to prove its ability to snag a national syndication deal and make a return on the investment. In the meantime, Ask Dr. Nandi has managed to clear at least one major hurdle by securing a weekly time slot on Detroit’s independent television station WADL. The show also airs in several cities in California on Stellar TV, a channel geared toward Spanish-speaking viewers. “I don’t think anyone ever thought it would get to this point,” Kali says. 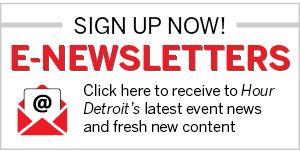 What may have been more complicated was the process of keeping the show in Detroit, and secondarily, meeting the technical demands of producing a show with the kind of sleek quality needed for the national stage. To eliminate that challenge, producers at first lobbied hard to ship production to Hollywood, where there was an entire industry ready and waiting to pump out yet another TV pilot. Going down that road would have guaranteed an easier learning curve for the couple. But Partha and Kali were adamant from the start that the show needed to stay in Detroit. 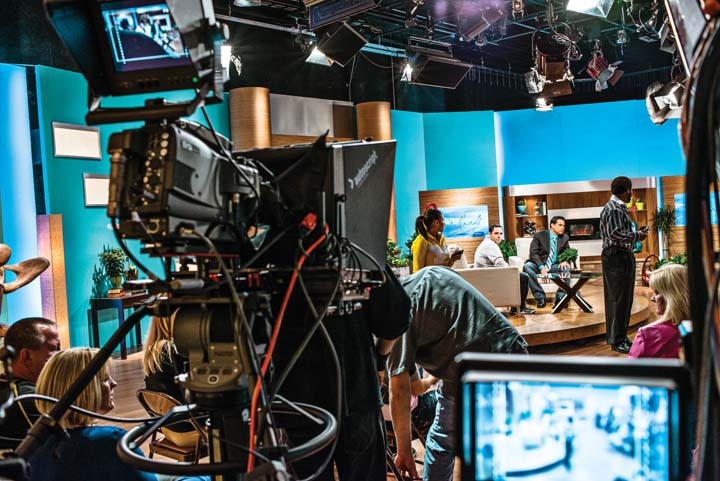 In that regard, Ask Dr. Nandi, with its goal of airing daily in national syndication, is a first of its kind in Michigan’s ongoing efforts to court a full range of productions aimed at a much larger audience. From the late 1970s to the mid ’90s, there was Kelly & Company, a talk show on WXYZ-TV that had high local ratings, but never aspired to air outside metro Detroit. Numerous feature films and scripted TV shows, such as the now-defunct Detroit 1-8-7, and a new show, Low Winter Sun, which filmed its pilot episode for the AMC cable network in Detroit in early fall, have since become typical recipients of the film incentives program that the Michigan Legislature established in 2008. 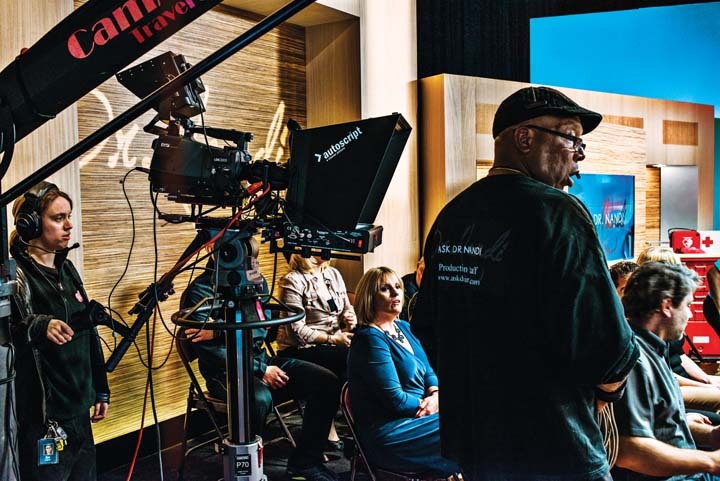 Talk shows, however, were never included until last January — a stroke of luck that boosted Partha’s and Kali’s efforts to showcase Detroit as a viable place to film. So while the state continues to receive criticism for restructuring the incentives program in 2011 (several productions decided to leave Michigan as a result), the direct refunds that are still available for production expenses ultimately proved strong enough for Ask Dr. Nandi, which is filmed at Detroit Public TV (WTVS) in Wixom, to stay on home turf. Partha and Kali have learned these lessons firsthand, working remotely with Los Angeles-based production designers, art directors, and producers to pull the show off. By early autumn, they had filmed 104 episodes. Partha is tall and every bit the handsome, made-for-TV host. Start a conversation with him, however, and it quickly becomes obvious that he’s more interested in asking questions about other people. That subtle confidence — it’s clearly not all about him — dovetails with what the couple want to do with the show. Born in Calcutta and brought up in the United States, Partha was a Rhodes scholar and the homecoming king at Ohio State University during his undergraduate years. He chose Wayne State University for medical school and would later become a die-hard Detroit sports fan. The conversation he had with the stranger about pancreatic cancer at the dinner party, Kali says, is typical of Partha’s philosophy — that people shouldn’t be afraid of being accessible, truthful, and empathetic, even with people they don’t know. According to Partha, patients are missing those emotional elements in health care, which is why he always dreamed of making a change in the industry beyond his work in private practice (The couple want to eventually start a medical charity organization). Partha originally thought politics would become that vehicle for communicating his message about medical care in the United States, including his belief that the insurance industry, tangled with red tape, routinely prevents doctors from being able to provide the most appropriate care. Ask Dr. Nandi is filling this need for now. Although Granader Sawalha has worked with Partha and Kali to create a “sellable” format, the Detroit-based show will stay true to the original vision, the couple says. That means no tabloid-style confrontations, no dramatic “gimmicks,” and no misinformation, elements that Partha says have befallen most talk shows he’s seen with a supposed medical spin. Each hourlong episode of Ask Dr. Nandi focuses on a single medical topic — ovarian cancer, traumatic brain injuries, or weight loss, for example — with one expert and one guest who’s willing to talk in-depth about his or her experiences. Guests have included Jeremy Britt, a Michigan native and the most recent winner of NBC’s The Biggest Loser, and Jerry Ball, a former Detroit Lion who suffered numerous head injuries during his NFL career. Because the show is on a tight budget, though, most of the time-consuming legwork required to find experts and guests, and even write scripts, has fallen to Partha and Kali alone. (A contract writer in California tried writing the first two scripts, but Partha didn’t think it sounded like him and has since written all of them on his own.) By contrast, national talk shows usually have six to eight production teams who might work on a single show for weeks. But during a five-day period in October, Kali spearheaded the filming of 20 shows. The same thing happened in November, a “grueling” schedule, Kali says, during which Partha got about four hours of sleep a night while juggling his full-time job in a private medical practice in Troy. And all this work will remain in Detroit if the team can’t ultimately sell the concept to TV executives, a process that will begin in early January when Partha and Kali start “shopping” the show for a syndication deal. “I worry that people will just think that we want to be on TV,” says Kali. “But it’s not that fun. It’s not that glamorous.” But is it worthwhile? Yes, say the couple, who are hoping all the work will pay off. Granader Sawalha says there’s a viable, national audience for the format, especially in cable news, where more and more shows are striving to be both entertaining and serious in content.